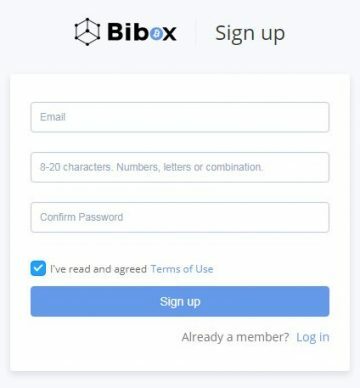 Bibox.com Review 2019 – Scam or Not? 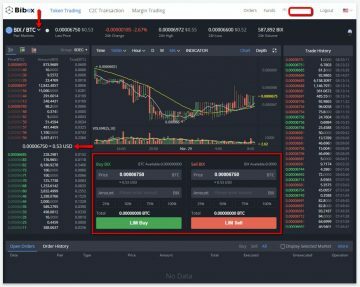 Bibox.com is a very young Chinese crypto-exchange that provides multiple altcoins to trade with. Today, we will be looking into what the website has to offer in general and show you guys a glimpse of what their website is all about. Without further delay, let’s talk about that! As mentioned, the website is a Chinese-based exchange website and was founded by people behind OKCoin and Binance (according to different sources) but we do not have solid evidence that this is true; only a confirmation from “Bibox365” from a Reddit post. The website also does not provide any information regarding this but this confirmation, for now, is enough. Verification levels are tied to creating an account with an exchange website. 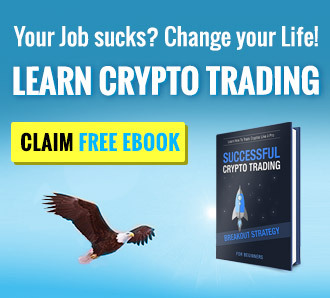 This is because some of the exchange/trading websites today have several verification levels that you need to go through in order to experience the full services provided by the website. And when talking about verification levels, you need to provide additional information to prove that you’re a real person. Information that’s usually required would be your complete name, proof of address, and proof of billing. 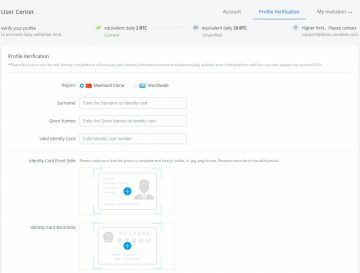 Does Bibox.com have this “verification curtain”? By creating an account, we will be able to answer this question. You can create an account with us through their website and go through their website with us. To create an account all you need to have is an active email account and a password with 8-20 characters. After providing your active email address and password, you will receive a confirmation email on the address provided that is written in Chinese. It’s just basically a confirmation and all you need to do is click on the first link provided and you’re all good. Just as we thought, there are a couple of tiers that you need to unlock if you are planning to do more than 2 BTC withdrawals per day. The good thing about their verification level is that this does not limit your daily trades; which is awesome. The stock profile that you will be getting will only have an equivalent of 2 BTC withdrawal limit per day. To increase this withdrawal limit, you need to go through profile verification that will require you to provide your region, complete name, and a scanned copy of your passport and passport number. In addition, users that request to have their account verified will need to get a picture of yourself holding the passport with a paper saying Bibox and the date you took the picture. After providing all the information needed a confirmation will be received saying that your daily withdrawal limit has now been increased to 20 BTC per day. If you need more than that all you need to do is request it by sending an email to support@bibox.zendesk.com and the representative will provide all the requirements needed for you to upgrade your account to the last tier. Now that we’ve created an account and talked about their verification levels, it’s time to look around at what the website features are! First on the list is their ability to provide services to people that talk different Languages. The website supports Mandarin, English, Korean, Russian, and Vietnamese. Bibox.com also provides support for BIX coins by giving out 50% discount on fees if you are using the coin to transact with them. Security is huge for Bibox.com that’s why they provide services beyond your login password. They support Google Authentication, SMS Authentication, and Funds Password. The added security measures make all registered customer’s accounts safe and away from a potential compromise of account. Aside from the quadruple layer of passwords, the website also provides a complete login record to help you keep track of your account’s activity. Registered account holders will be able to invite their friends in creating an account with Bibox.com and earn up to 50% of commission per trade. Referral programs are a good sign that the website is willing to get more people on board. This means that the website is willing to grow and improve their services for a much better experience in general. If you plan on creating an account with Bibox.com, then we suggest you go for their referral program. The website shows an advertisement about their Bibox App but we looked into our Android and iOS devices the App is nowhere to be found. The website says something about “Windows” and “Mac” giving us the idea that this might be a computer-based application. In addition, the provided buttons for download were not working when we tried them out giving the impression that this might be a feature that’s still in the works. We have already talked about the withdrawal limits the website provides their customers giving you guys an idea of the limits imposed depending on the level of your account. As you might have noticed by now, the website operates completely with the use of crypto thus there is no Fiat option for deposit and withdrawals. Available coins for deposit/withdrawal are: BTC, BIX, ETH, ETC, BCH, LTC, BCD, USDT, EOS, TNB, BTM, CMT, PRA, LEND, RDN, MANA, HBP, SBTC, ETF, EMO, MKR, DAI, ELF, ITC, MOT, BTO, GNX, CAT, GTC, AWR, CAG, SHOW, AIDOC, AMM, WAX, C20, SNOV, BLT, DTA, GTO, JNT, SXUT, CZR, TNC, CPC, TRX, FSN, UUU, ABT, KICK, KEY, PXS, BBN, LEDU, MED, QTUM, NEO, DXT, LGO, DASH, NPER, and ACAT. The latest update regarding trading Fees is 0.10% for the Taker and Maker. As mentioned earlier, you get 50% discount on the Fees if you use BIX to pay for the transaction. In addition, depositing money into your Bibox.com account does not require you to pay for anything and withdrawal fees are not charged directly by the website but are network fees. You can read more about their fee schedule here. Now that we’ve talked about creating an account, the website’s features, and how to get your money in and out of the website, it’s time to talk about how to trade in Bibox.com! 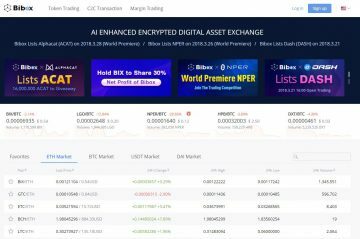 Here at Bibox.com, you will be able to choose between ETH Market, BTC Market, USDT Market, and DAI Market which are their main markets our of the dozens available that you can choose from. If you want to access any pair, all you need to do is click on the main list and you will be redirected to the trading platform. Shown in the sample screenshot above is the pair BIX/BTC. To change the market pair that you want to trade or just check the available ones that you can change, click on the arrow shown on the upper left-hand side of the trading platform. This will open up a drop down box with the complete list of available crypto that you will be able to trade here. The left-hand side panel will also show the current trading price of BIX/BTC or the selected market you are trading at. The platform is pretty basic compared to other exchange/trading websites today. The graph is located in the center of the platform and the order slip is right below that. Shown on the order slip will be the best price that you have for the day. The trader can also change it manually by clicking on the price box and entering the desired buy/sell price. An additional feature that is not working at the moment is the leverage buttons located on the lower part of the order slip. Available leverage options for future trades are 25%, 50%, 75%, and 100%. We have and will always stress out how important it is to make sure that the website that you are dealing with has ample customer service to help you out in case you need assistance. Bibox.com does not have any phone numbers that you can call to ask for assistance but they do have an email which you can contact at support@bibox.zendesk.com or talk to them through Wechat: BiboxKf-02. Interested parties/customers can also get a hold of them through social media websites like Facebook, Twitter, Reddit, and Instagram. User Experience is also an important factor that traders need to look into if they are planning to invest funds into a centralized exchange website. The reason for this is security. Exchange websites like Bibox.com accept deposits and withdrawals that go through their system. This makes every customer’s funds vulnerable to any possible attacks and without any solid explanation on how assets are being stored, it is imperative to know what people say about their services. So what are people saying about Bibox.com? There’s a post on Reddit talking about issues with their deposited Ethereum but at the same time, people are also claiming that they have no problems whatsoever with ETH transactions with the website. You can read more about it here. Judging on how the website is designed, it is obvious that it was meant to cater the Chinese audience but with the plan of providing worldwide coverage. Bibox.com provides a decent trading platform that people would consider using in time (after adding leverage) due to its nature in general. You get 2FA security for your account; get to choose from dozens of crypto markets with one of the lowest trading fees in the business today. Though Fiat payments are not available, this is not a definitive choice which can be added in the future due to the number of people that actually like trading with crypto and has the power of using Fiat at the same time. Please share with us your personal experience with the website in the comment section below.